Roar Uthaug's Tomb Raider marks the first time that a videogame property has been given a second, non-sequel chance at leaving its mark on the Hollwood scene, though gamers who have stuck with Lara Croft over the years may be quick to point out that this is a dramatically different version of the character. The iconic heroine received a successful reboot-slash-prequel in the gaming realm roughly half a decade ago, and while that version of Croft exhibits similar gusto, smarts, and fondness for archaeology, she's also leaner and greener as she develops the survival skills that'll shape her into a formidable explorer. So, it isn't unreasonable to argue that she's close to an entirely different Lara Croft … and since this adaptation works from the narrative of the rebooted game, it's an entirely different adaptation than the Angelina Jolie vehicle several years back. 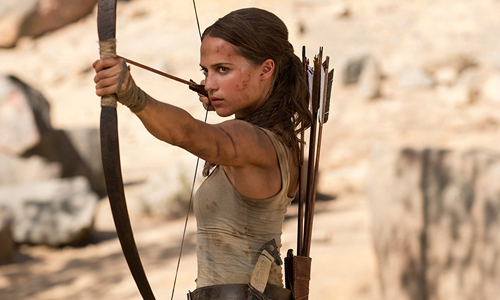 Both share one key puzzle piece in common, though: the lead actress' embodiment of the heroine ends up being the strongest element of Tomb Raider, though the movie exploding and crumbling around Alicia Vikander's sturdy portrayal is marginally more substantial. From the start, it's clear that screenwriter Geneva Robertson-Dworet and her team have watched the first Tomb Raider film and used it for reference, but more as a map of how to create almost the opposite kind of Lara Croft than that of the original. Instead of portraying her as an unabashedly wealthy heiress who's almost invincibly trained and prepared for what's thrown at her, we see this Lara Croft (Vikander) getting taken down in sparring martial-arts matches, crashing her bicycle while zipping around downtown London, and doing whatever she can to make enough money to survive. It's a far cry from the woman who trains with her own personal killer robot, in a inhouse Egyptian tomb, and bounces around on suspension cables in the middle of her mansion for recreation. This Lara Croft isn't the hero made of fantasy, but someone who's trying to built herself into a genuine sort of heroine in the willful absence of her family and their wealth, driven by the disappearance of her father seven years prior. With a strong English accent complimenting her dialogue, Alicia Vikander adds high-caliber authenticity to Lara Croft, giving her a slim yet durable presence while she grapples with the burdens of essentially being an orphaned member of an illustrious family. Much like other videogame adaptations, there isn't a rush to get to the main action at the beginning and there's plenty of room to bulk up the story's depth and characterization, and this Tomb Raider uses the time to explore a more genuine take on Lara Croft's perceptions of her lineage and her adventure-seeking capabilities. Granted, sure, there's a bit of "Tomb Raider Begins" tonality going on during training sessions, boardroom conversations with her guardian, Anna Miller (Kristen Scott Thomas), and hazy flashbacks to conversations with her father as their family's mansion stands in the background. Vikander's spunkiness while bringing to life Lara Croft's drive to improve herself elevates this expansion of the mythos unseen in the game, tapping into strength and determination that yields an admirable heroine without exaggerating the "girl power!" aspect of it. The bond with her father serves as a meaningful emotive backbone to how Lara Croft gets whisked into the adventure of Tomb Raider, which forces her to an uninhabited island near Japan, a location tied to mythology and to her father's mysterious professional endeavors. A natural progression of events get her onto a ship and into the company of its captain, Lu Ren (Daniel Wu), testing her wherewithal and acquired skills every step of the way without simply dropping anything in her lap, with Roar Uthaug's conscientious direction lending weight to the beginning of her journey. Once they're in proximity of the island, blockbuster storytelling does put the film on autopilit as Lara finds herself at odds with Mathias Vogel, the wiry leader of an excavation with similar interests to her father's business. Despite Walter Goggins' phenomenal ability to combine intense villainy with little flickers of sympathy for his sacrifices, the moving pieces of his plan and his treatment of Lara fit snugly into the template of a cat-and-mouse chase on an island ... which, admittedly, do echo the broad strokes of the game's overarching plot. There were some early concerns about the authenticity of the action in Tomb Raider based on the key theatrical trailer, which features Lara lunging over a waterfall from the rusted wing of an airplane to its body, a scene that's more than a stretch due to weight and gravity. Perhaps it's because of an exaggerated memory of the scene in my head, but that bit -- while still there -- seemed to have been edited down to make it more credible, an impression that many of the action sequences gave off. Some ludicrousness still hangs in the air during the film, especially involving all the drama manufactured with missed assault-rifle shots and a particular scene involving a parachute, but Roar Uthaug seems have reined in a lot of potential outlandishness in boat crashes, bow-‘n-arrow kills, and hand-to-hand combat pitting Lara against larger, formidable opponents. He also ensured that Lara never completely becomes that kind of full-throttle action hero, either, coupling Alicia Vikander's aware, roughed-up performance with pushing the character's tolerance level for violence and high-stakes events further and further. Along with polishing this iteration of Lara Croft into the future jewel for a franchise, the plotting in Tomb Raider, while far from spectacular, gets the job done in a very critical area involving the character: she actually gets to raid a tomb, scaling complicated walls and solving puzzles largely on her own accord. Deep into his take, director Uthaug finds a way of encapsulating the experience of playing the title game and projects it on the big screen, a claim that most videogame adaptations cannot make. 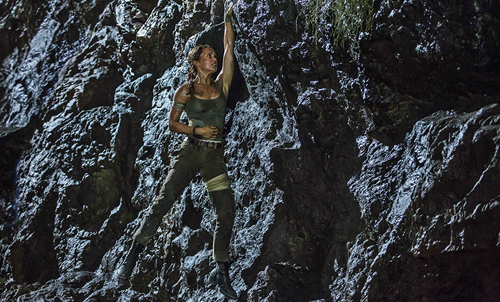 Throughout the climax, realism and the supernatural weave together with the expectations and mystery involved with Lara Croft conquering sections of one of her tombs, and while brief, there's a stretch where she's completely alone and working her way through surviving harrowing challenges. While Tomb Raider absolutely could've been both more daring and rational with its storytelling, it's there that this second shot at Lara Croft hits the bullseye in getting the spirit of the character right and utilizing her experiences and obstacles to chisel out a worthwhile heroine, one who'll hopefully rise up for another adventure.